Warren’s “Eerie” officially appeared on the newsstands/at the newsagents with Issue number two. Number one was only an “ashcan” edition supposedly meant to claim copyright of the title. I’m puzzled as to what that was meant to achieve. There had already been a number of comics entitled “Eerie” not too many years previously so didn’t someone somewhere already own the rights to the name ?? IW/Super produced three issues of Eerie, numbered 1,8 and 9. No I don’t understand it either. And number 1 was mostly material from “Spook Comics” from the 1940s. Not too long after Warren began publishing the title even Alan Class used the name. 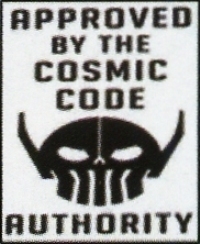 Why Alan would go to the trouble of producing a new logo for a one-shot no-number comic that only contained the usual ACG material already available in his other monthly reprints is another mystery to me !?! 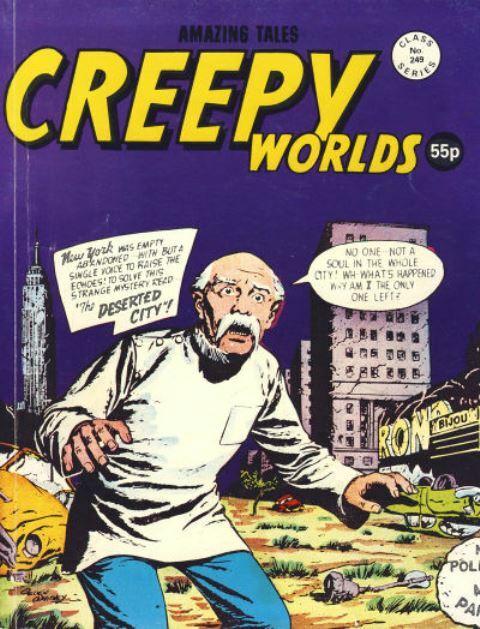 The cover and contents of the mid-1960s un-numbered “Eerie” (cover story from ACGs “Adventures into the Unknown” 74 of 1956) was finally recycled by Alan Class for the last ever issue of Creepy Worlds published in 1989. A number of Warren comics were reprinted by K.G.Murray in the 1970s. Eerie is currently available monthly, although I prefer collecting the Archive books of the Warren series. 15 and counting so far ! !